H hung out with me in my sewing room, playing with some new toys and her beloved box of scraps (which I did not touch, those are hers). 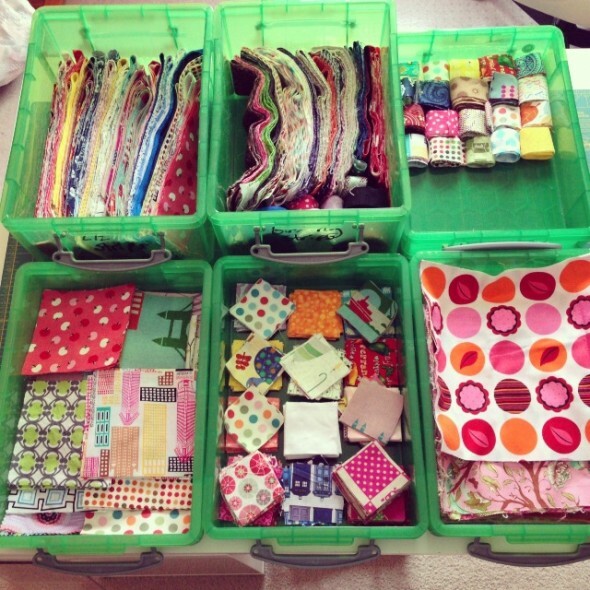 I ironed, cut, and sorted six Really Useful Boxes ($3 clearance at Staples just because they were green!) full of fabric in various shapes and sizes. 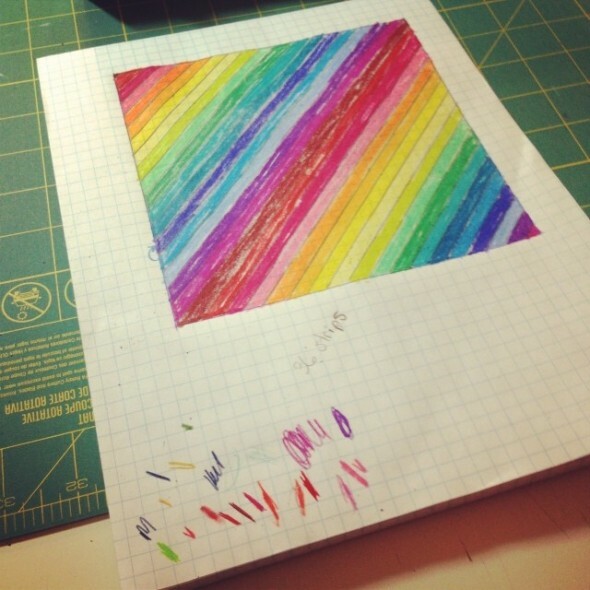 Clockwise from top left: 2.5″ strips, binding strips (mostly 2.25″), 1.5″ strips, 10″ squares, 2.5″ squares, and 5″ squares. And THEN, in the most exciting news of the week, my first article in print was published!!! 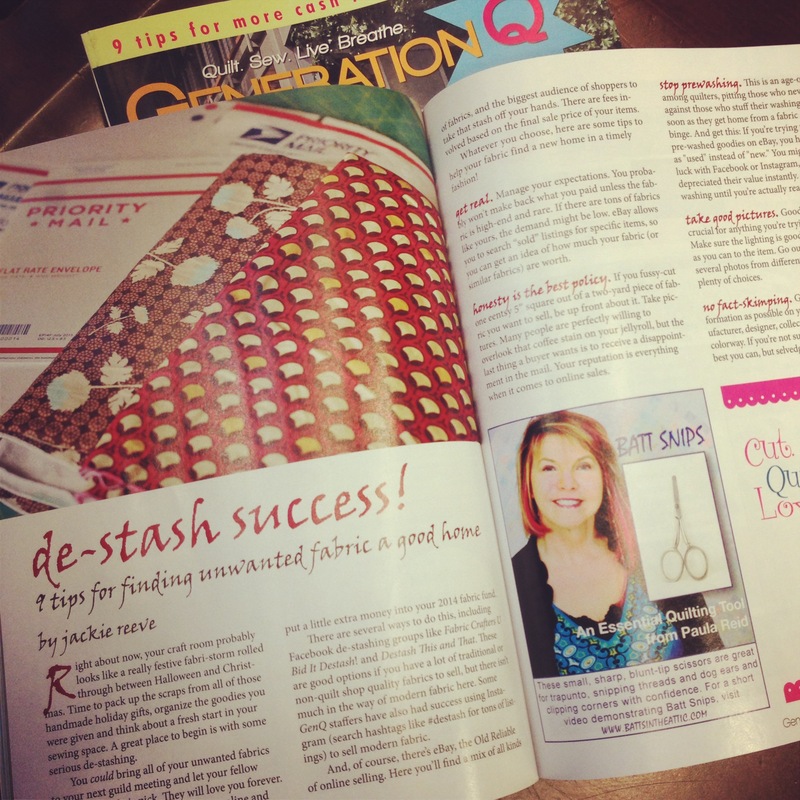 It’s an article on selling your stash in the January/February issue of Generation Q. The issue went on sale NYE, but I wasn’t able to get my hands on one until January 2nd. Since I wrote and submitted this article back in September, and it was technically published in 2013, I don’t think this counts towards my “Start writing for at least 2 new outlets” resolution. But I was literally dancing around Barnes and Noble when I opened the magazine and saw my piece. It’s actually a 3-page piece, with my photo and bio on the last page and everything! So amazing!! I also started sketching ideas for a new quilt using some of those enticing strips I’ve cut up. I’ve even read 7 picture books so far this year, just because H and I were having fun at the bookstore. I’m really getting excited about 2014, you guys! It’s starting out on such a positive, bright note. Congratulations on the publication of your first print article! Congratulations! I am happy to say I know someone published.